Enjoy Whitefish with a "retro" vibe! 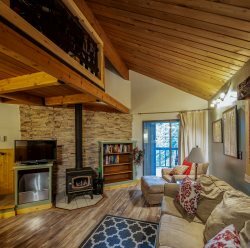 The main level features a completely furnished kitchen, bathroom and living room with a fireplace, HD cable TV, DVD and high speed internet . Queen sofa sleeper. Large private deck with BBQ and views of the Whitefish lake. Lower level: BDRM #1 King BDRM #2 Queen & bunk bed. 2nd bathroom. Loft: 2 Twin beds. Near indoor pool, tennis courts and playground. Sleeps 6-8.